We believe in good design- and we believe in sustainable, eco-friendly wood displays. Whenever possible we present wood options that are grown and harvested in a manner that is good for the environment. 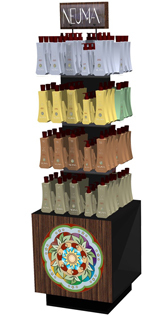 We have produced custom retail displays in materials such as bamboo and plant fiber panels. We use low-VOC finishes, and recycled materials in both our displays and packaging whenever possible. Our custom retail displays make both our clients and our planet happy. Request a quote today or contact Simply Displays to learn more about wood-based custom retail displays.